The Modello series brings energy and life to any surface! 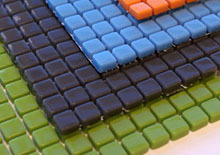 The bright color palette offers over 45 glass tile color options. You can use your imagination to create endless blends, gradients, and murals combinations. The Modello can be used in the interior or exterior; residential to commericial settings. Along with the large color palette, there are several shapes and sizes that can add dimension and attractive lines to your project. All sizes are listed below and will come in any color on the sample board. Be creative with your next project, and let Modello glass tile colors bring life to your setting.